Summary: Corruption has sparked headline-grabbing protests around the world in recent years, yet the mainstream response has not come close to meeting popular demand for relief. Corruption has sparked headline-grabbing protests around the world in recent years, and the issue has upended political campaigns in Europe and the United States. Yet the mainstream response to this phenomenon has not come close to meeting popular demand for relief. 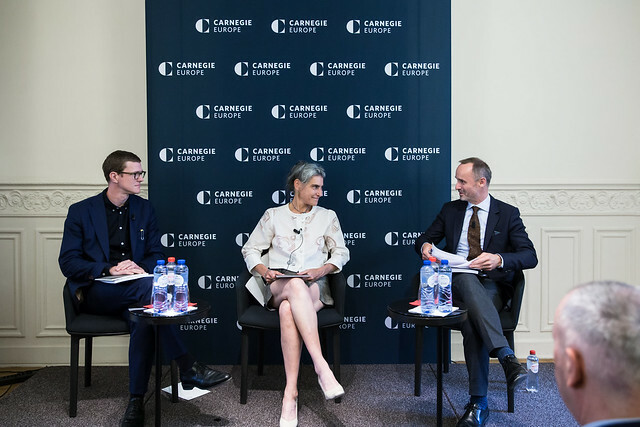 Carnegie Europe, in partnership with the Global Challenges Foundation (GCF), hosted a public discussion that will shake up your understanding of corruption. Sarah Chayes, senior fellow at the Carnegie Endowment, challenged conventional wisdom and explore how corruption animates sophisticated and successful transnational networks—resulting in violence, environmental devastation, and popular indignation, with findings from the case of Honduras. Fredrik Karlsson, project leader at the Global Challenges Foundation, commented on the links between corruption and global instability and identify the governance mechanisms that are needed to counter the risks. Tomáš Valášek, director of Carnegie Europe, moderated. The event marked the European launch of Chayes’s report When Corruption Is the Operating System: The Case of Honduras and the announcement of the GCF’s $5 million New Shape Prize on global governance. Copies of Chayes’s publication and of the GCF’s annual report, Global Catastrophic Risks 2017, were available at the event. Sarah Chayes is a senior fellow in the Democracy and Rule of Law Program at the Carnegie Endowment for International Peace. Fredrik Karlsson is the project leader for the Global Challenges Foundation’s New Shape Prize competition. Follow him on Twitter @JFKarlsson.